The Australian Domain Registry has recently approved direct registrations within the .AU domain, for example “yourname.au”. At the moment, all .AU domain names are registered in a second level domain, such as “yourname.com.au” or “yourname.net.au”. According to the survey conducted by the .AU Registry and sent to 97,000 selected at random registrants in COM.AU, NET.AU, ORG.AU, ASN.AU and ID.AU, 60% of participants seem likely or highly likely to register a “yourname.au” name, if it was available. bring additional value to the .AU domain name system in respect to various user operations: registrars, resellers, and registrants. The next phase in the process of implementation of direct .AU registrations is establishing the best approach by developing detailed policy and carrying on stakeholder consultation. Further announcements from the .AU Registry on the progress of the implementation work are expected during the year. In the meantime, you can still register memorable .AU domain names even if you do not have local presence in Australia – please check out our Local Presence Service. Use our search tool to find out if the name you are looking for is available. If you have questions or require more information about .AU domains, please contact us at support@europeid.com. Registration of .AU domains via our website system is currently unavailable. 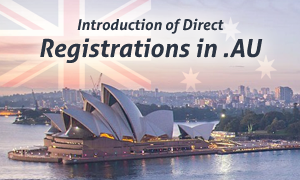 Contact us to register .AU domain name at relations@europeid.com.